I was recently reached out by House of Fraser who asked me whether I would be interested in reviewing a bakeware set to create some amazing bakes with. 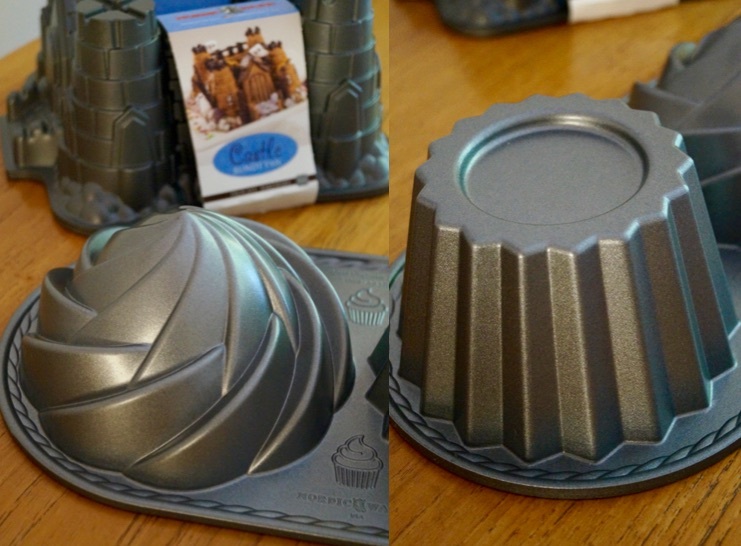 I received a cute cupcake pan and a castle bundt pan. I made a big cupcake for a family birthday earlier in the week, I’m quite proud of the giant cupcake, as it was my first attempt ever at making one! I’m fine with standard cupcakes, but frosting layer cakes is not my forte. To test out the cupcake pan, I baked a basic vanilla sponge cake and then decorated the cake with white chocolate buttercream, rainbow sprinkles and colourful sweets. 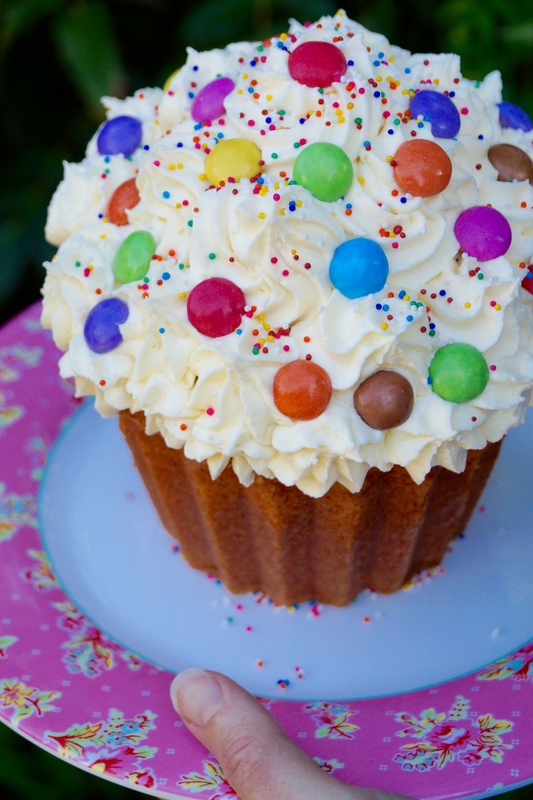 So here it is, this is my fun and easy recipe for a giant cupcake! It was my grandads 80th birthday earlier in the week and I wanted to bake a show-stopping cake perfect for this extra special occasion! As I mentioned earlier in this post, House of Fraser recently got in contact with me about working on a creative baking campaign and offered me the opportunity to test out and review a high-quality bakeware set. 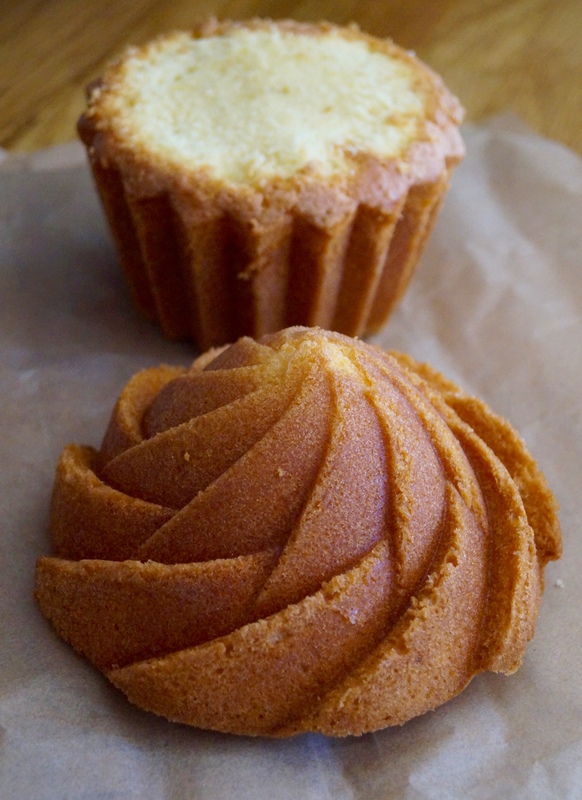 I am really impressed with the bakeware so far and I’m already planning my next giant cupcake creation! The cute cupcake pan by Nordic Ware is absolutely fantastic. I think it is my new favourite cake tin! The cake pan is cast aluminum, this is great because it ensures the cake bakes really evenly and has a nonstick interior for easy release and cleanup. I used my perfect vanilla cupcake recipe as a base for this giant cupcake, but only the change I made was I upped the ingredients slightly to make more mixture for this cake pan. To decorate I piped homemade white chocolate buttercream onto the top in swirls, which turned out to be much harder than I had first thought as my piping skills aren’t the best! Then I simply scattered over sprinkles and pressed some coloured sweets into the buttercream. If like me you’ve been inspired by The Great British Bake Off you can visit the link here on House of Fraser’s website and browse the bakeware. Preheat oven to 160 Fan / 180°C / 200°F / Gas Mark 4. Grease the cake pan well with butter – making sure you grease really well in all the grooves. Line the bottom of the base section with a circle of greaseproof paper. Set aside. Cream the softened butter/margarine with the sugar and vanilla until fluffy and pale in colour. This will take about 4-5 minutes. Add the eggs one by one, and beat in until fully incorporated. Finally add the flour, along with the milk/water and beat for 20-30 seconds until no lumps of flour remain and the cake batter is smooth. Distribute the cake batter between the cupcake pan, bake for 40-45 minutes or until a cake tester comes of clean of any uncooked batter. Once baked fully, leave the cakes to cool in the pan for 15 minutes. Then carefully turn out onto a wire rack and leave to cool completely. Once cool, frost with your favourite buttercream. I made my favourite white chocolate buttercream – to make it, cream the softened butter until pale in colour. Then add the icing sugar and vanilla, and and mix to combine. Continue to beat for 5-7 minutes, or until really fluffy. Finish by adding the melted chocolate, and whisk until combined fully. Use a small amount of the buttercream to sandwich together the two cake halves, then fill a piping bag with the buttercream and pipe onto the giant cupcake. 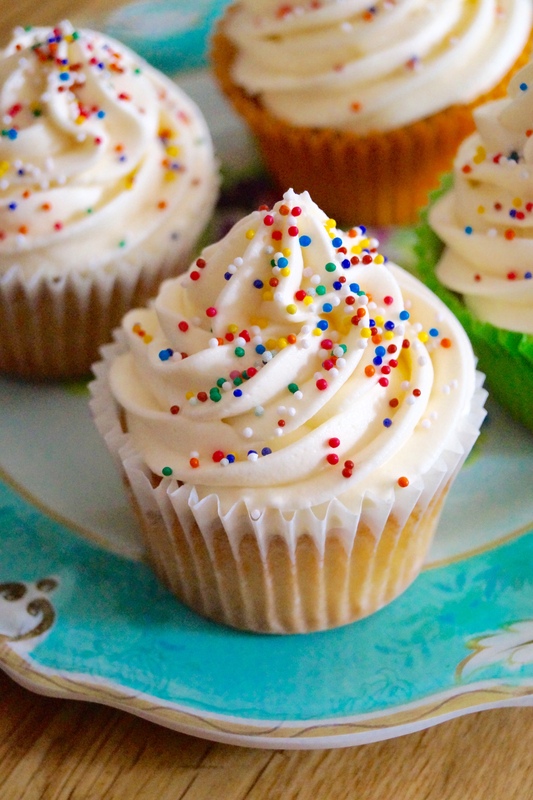 Decorate with sprinkles and sweets! Wow what a gorgeous cupcake, Jess! I’m in awe of that delicious frosting on top! I have been craving cupcakes with a bunch of frosting on top so now you have me swooning and whispering sweet nothings to these cupcakes at work! How neat is that! That would made a fantastic birthday cake for my nieces! Well done Jess! If there’s anything better than a cupcake, it’s definitely a giant one! This looks delicious, Jess. Wow Jess, this cupcake looks delicious! I am sure your granddad will love it! What a fabulous opportunity to try out these bake pans! I love the giant cupcake! Happy Birthday Grandad! Happy birthday to your grandpa! 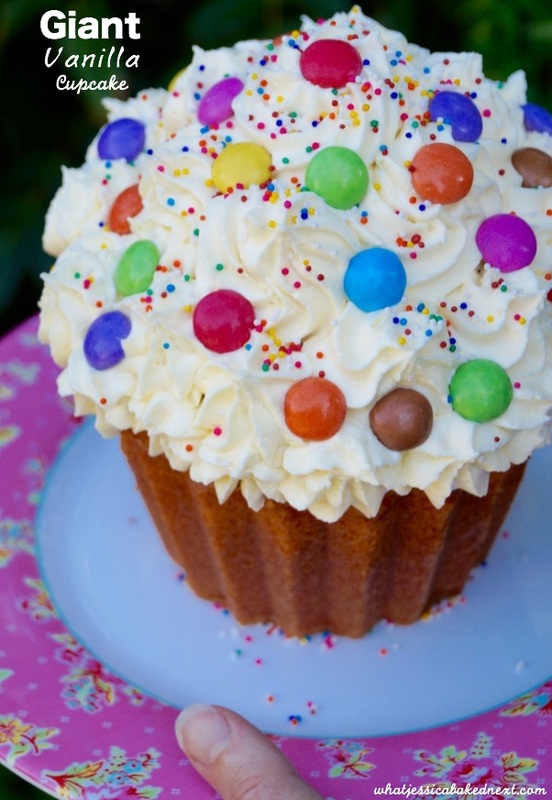 A giant cupcake is the perfect way to celebrate! It’s so pretty and adorable! I am so down with an XXL-sized cupcake! I mean, bigger is always better right?? In love with this, Jessica! oh my gawd, I love that GIANT cupcake!!! I need those Nordic Ware pans! I LOVE that – must, must have that pan. Now if you’ll just teach me to frost it as beautifully as you did! You did an awesome job with these Jessia! Im loving the shapes of the cake moulds, so unique! I love giant cupcakes! This looks so beautiful Jessica, it’s perfect! You are so talented! This is so cute! I think my niece would love something like this for her birthday – just a shame I am not very good at baking. This is so fun! I had no idea the “frosting” layer was also a cake. That looks so tasty! Have you tried other flavours than Vanilla? Hi 🙂 Thank you so much! I haven’t tried any other flavours yet, however it’s something I’d be interested in doing in the future. I’m thinking maybe caramel or chocolate would be really good! Hi Beatrice! 🙂 Thank you so much, this giant cupcake is one of my favourite bakes. I reckon this recipe would serve about 10-12 people at most, maybe fewer depending on how big you cut the slices.